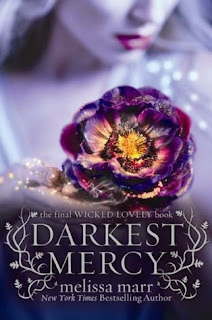 I have my sneaky friend Alicia to thank for slipping me her ARC of Darkest Mercy --the final installment in Melissa Marr's Wicked Lovely series featuring the many wily courts of faerie. I've been looking forward to some desperately needed closure on this series for awhile now. I still remember running across Wicked Lovely what seems like so long ago and loving it. I fell even more in love with the darker Ink Exchange , which cemented my fascination with and unhealthy substantial interest in His Uber Dark Lordliness Irial. And the fabulous short story "Stopping Time " sort of pushed me over the edge as far as my admiration for Marr's storytelling skills and my love for some of these characters went. The other two installments in the series fell a bit flat for me for various reasons. And so I held my breath as I opened up the last one, hoping it would resolve things in both a satisfactory and suitably complex way. High expectations much? Who me? Nobody is where they should be. Keenan is missing by his own choice. Aislinn is grasping at straws trying to keep the Summer Court afloat in his absence. Seth is floating between this world and that, courting disaster with his various alliances. Niall is losing is grip on the Dark Court with every ragged breath Irial draws. And Bananach is ranging free, inciting death and destruction wherever she goes. Too much discord, too much uncertainty haunts the courts of the fae as their regents struggle to retain power and protect their people. Donia and Aislinn have taken to meeting on a semi-regular basis to discuss their options, though summer and winter have never been pleasant bedfellows. Seth and Niall dance dangerously around their loyalties. And the Gabriel Hounds are out in force as Bananach's trail becomes more littered with bodies. Then a stranger shows up in Hunstdale, full of foreboding and guile. And he seems to know more about each of the main players than should be possible. But one thing is clear, he is just one more unknown quantity in the path toward conflagration they all seem to be walking. I really had no clue as to how things were going to pan out. I had hopes. Of course I had hopes. For Irial/Niall/Leslie most of all. And Donia. I have always loved Donia. Though I'm pretty sure she deserves better than Keenan--she loves him. And I wanted her happy. And, as long as we're confessing, I may have been harboring a few leftover leanings with regards to Seth and Ash. Because they were great in Wicked Lovely , and what happened to them could not strictly have been avoided. Though there are always choices. And you can choose happiness. And those are my two favorite messages from this series. Ones I won't forget soon. But, overall, this last installment was a letdown in so many ways. Everything played out expediently and essentially along the lines of what I was expecting. But, somehow, it did so with an utter lack of the feeling and emotion that characterized the previous books in the series. There were scenes and particular moments which elicited a smile or a sigh from me, but they were just too few and far between to balance out the strange sense of rote apathy that pervaded the rest of the story. I ended it very puzzled by this, as the strongest emotion I felt at the close was gratitude that this character or that hadn't died. That was it. No joy or relish in the way it came about or in the sacrifices people made. I guess it just wasn't my book. And the ending doesn't taint my love for my favorites of the others. I'm not angry or even too sad. I closed it with a vague feeling of regret at its low impact, and I moved on. Mine is rather an unusual reaction, though, it should be stressed. By and large, I feel certain fans of the series will think this last book closes things out with a bang. See reviews below. Darkest Mercy is due out March 1st. Oh I'm so sorry you felt that way. I actually loved it. But I think series enders always have a lot to live up to. Someone who agrees with me. I was not very happy with this finale installment. Lots of times, nothing made sense. Irial and Niall in one body, weird. Ash annoyed me as did Seth. I've only read the first two in the series since so many have told me that those were the best. I must say though that the covers keep drawing me in - I may have to just give in and read the rest. Well, bummer. Is it worth buying new or should I wait to get it from the library? This is interesting. Thanks for your review! I still have book one and have yet to start them, but really want to give them a try. I have got to start this series! Dang it! I think we all agree that the covers for these books should be framed. I think you nailed the problem I've had with the series since IE -- it feels really bloodless to me. There are these characters and this arcane world and no one seems very attached to each other or to the emotions they have or to the lives they are leading. I started FE and gave up halfway through because I was as apathetic to all that was going on as they were. Also, I mostly only ever liked Donia. Wonderful review. I'm sad to hear this series didn't finish up as strongly as you would have liked. Especially for Irial. Boo. I need to get around to finishing these books one of these days. This part I did not like me. Unfortunately, the outcome is a bit boring. However, a "dangerous game " I do not know what the English title. I think it was very good.